1. The word “hymn” usually denotes something which consists of two elements: a TEXT and a TUNE. 2. A hymn text could be married to any number of hymn tunes, and vice versa. 3. One need not be a professional musician to understand the difference. Here are 5 different hymn texts (PDF link) married to the same hymn tune (LASST UNS ERFREUEN). Imagine if an organist played all five versions during the week: All Creatures Of Our God And King on Monday, This Holy Covenant Was Made on Tuesday, A Hymn Of Glory Let Us Sing on Wednesday, Ye Watchers And Ye Holy Ones on Thursday, and Sing We Triumphant Hymns Of Praise on Friday. Then, imagine if this same organist said to his priest, “Are you amazed that I played five different hymns this week?” Is it not obvious that this statement is imprecise? The organist did not play five different hymns at all. He played the same hymn tune which supported five different hymn texts. 4. Hymn tunes generally have “funky” names (such as BATTY, DUKE STREET, HYFRYDOL, DIX, DARWALL’S 148TH, DOWN AMPNEY, ERHALT UNS HERR, etc.). The same hymn tunes are often called by different names, as well. For instance, one of the editors of GIA Worship IV made a criticism of the Vatican II Hymnal, claiming that it lacked the tune GAUDEAMUS PARITER. As a matter of fact, the Vatican II Hymnal does contain that exact tune, but calls it by another (more common) name: AVE VIRGO VIRGINUM. 5. The editor of a hymnal could say, “My book has 400 hymns.” Another could say, “My book has 700 hymns.” Another could say, “My book has 1,200 hymns.” But what does that really mean? For the conscientious musician, the more important thing is often the number of hymn tunes the book contains . . . and the hymn texts to which they are wed! For instance, would it make sense to join an extremely beautiful hymn tune with a text that can only be sung once a year? Or should (perhaps) an effort be made to make sure that lovely tune will be enjoyed more than once a year? And should not steps be taken to ensure important hymn texts for the various seasons are not supplied over and over again with the same hymn tune? This is the approach taken in the Vatican II Hymnal: judiciously selecting the hymn texts and the tunes, giving great thought to the liturgical year, and so offering a variety in tunes and texts without excluding a reasonable amount of familiarity. 6. Once we realize that a “hymn” consists of two parts, we will be prepared to answer the recurring question: “Is such-and-such a hymn Catholic or Protestant?” We will draw a distinction between the melody (hymn tune) and the words (hymn text). From that point forward, we can begin to speak with clarity. 8. Once we realize how radically different Gregorian hymns are from “common practice era” hymn tunes—the ones we have been speaking of, like LASST UNS ERFREUEN, HYFRYDOL, NUN DANKET ALLE GOTT, and AURELIA—we will be clear and precise in our language. 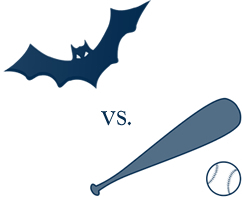 We will realize that mixing up Gregorian hymns with “common practice period” hymns is every bit as confusing as mixing up a baseball bat with a flying mammal. 9. Another common source of confusion arises when people refer to “devotional songs” as hymns. People will speak of “the good old Catholic hymns,” but are actually referencing songs, such as City of God, Be Not Afraid, Eye Has Not Seen, Peace Is Flowing Like A River, and One Bread One Body. Common practice period hymn tunes are constructed in a certain way, especially as regards rhythm, syncopation, and chromaticism. Devotional songs, which can be very beautiful, are different; they are composed according to the conventions of secular music, especially as regards rhythm, syncopation, and chromaticism. The melodies are usually highly emotional and rhythmically-driven. A quick way to tell the difference between a hymn tune and a song is this: a song needs accompaniment to “work,” while a hymn sounds great with or without accompaniment. 10. 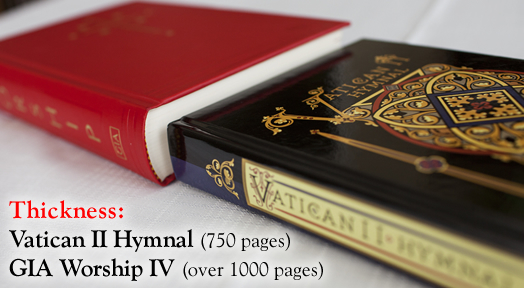 In the Vatican II Hymnal, we included hundreds of beautiful hymns, but we did not include devotional songs. Again, the reason is that devotional songs are often written in a secular style, and the Church does not allow this style to be used during the Holy Sacrifice of the Mass, though it has become common practice in many parishes. Many devotional songs are quite beautiful and enjoyable to sing: however, they are unfit for Mass, due to the compositional techniques they employ. In mission countries, the Church does allow for some degree of “inculturation,” in terms of taking what is best from various cultures and adapting it for use at Mass. However, the Church also lays down very strict regulations about how this is to be done. Unfortunately, there are too many Church documents regarding Sacred music to quote in this article, but perhaps a start might be to study the quotes contained in this video. Click here to read “Part 2” of this article.